Have you ever wondered how book awards are chosen? We’ve put together a set of resources below to help you get started. If you are interested in participating in our first annual mock award process, let us know which mock award you are interested in “hosting” in your classroom. We recommend that you review the website for the Charlotte Huck Award and the Orbis Pictus Award to decide which one is most likely to capture your interest and that of your students. Participating in the mock award process means making a commitment to reading as much fiction or nonfiction as possible during the first three months of the school year. Here is a brief overview of the process. Choose which award you’ll participate in and let us know using this form. Find books that fit the award criteria. Read, read, read and discuss them all with your students. As a class, come up with a list of six to ten finalists and hold a vote by November 9, 2018 to determine the winner. Let us follow along with your entire process using #NCTEMockHuck or #NCTEMockOrbis. You can find more detailed information in our Huck and Orbis Pictus Mock Award Getting Started Guides below. You will find instructions and resources pertinent to each award below. We would love to know who is doing these mock awards, and we’ll send periodic messages to participants as new resources become available. Please fill out this brief form so we can stay in touch! The Charlotte Huck Award for Outstanding Fiction for Young People was established in 2014 in honor of Dr. Charlotte Huck, who was a tireless advocate for the use of high-quality children’s literature in the classroom. Not only did Charlotte view children’s literature as appropriate and engaging material for learning to read, she believed that books hold the power to change children’s lives. The Huck Award recognizes the potential that books hold to expand children’s worldview by fostering compassion, imagination, wonder, and perspective-taking. Each year a committee of seven educators reviews a wide range of fiction published for children ages 3–12. The award is bounded by a calendar year, considering all the fictional titles published in that year. Committee members read continuously, discuss stand-out titles, and as the summer winds down and fall approaches, they narrow their list of favorites, creating a list of finalists that meet the award criteria. At the NCTE Annual Convention in November, the committee holds a full day of deliberations carefully considering each of the 30–40 finalist titles they have identified. Discussions are rich and multifaceted as committee members use the criteria to build cases for their favorite books. By the end of the day, the committee members have identified a winning title, five honor books, and eight recommended books. Everyone looks forward to making the big announcement. We invite you and your students to parallel the efforts of these committee members, holding a Mock Huck Award competition in your classroom. The beginning of the school year is an ideal time to focus on reading titles that build compassion, imagination, and wonder, as these are essential elements in a classroom community. You’ll want to begin by introducing the award and the deliberation process to your students. Open up a conversation about book awards, asking your students to discuss which book awards they know about and how they think book awards are given. Explore the Huck Award website, reviewing the titles of past award books. You may want to read one of the winners or honor books aloud. This is an effective way to introduce your students to the criteria for the award. After your students have had a chance to share their initial responses to the book, invite them to talk about the book in terms of the award criteria. Share your intentions to engage in wide reading this fall, conducting a Mock Huck Award process. Share your enthusiasm for working as a class to identify the titles that you think are most deserving of recognition. There are many resources available to you as you seek out eligible and age-appropriate books to share with your class. If you have a school librarian, draw on his or her expertise. What 2018 titles have come into the library? What 2018 books have gotten strong reviews in The Horn Book Magazine or School Library Journal? If your school does not have a library or certified school librarian, reach out to your local public librarian. You can also scan the “new books” shelves at your local library and pick up the books that you know will appeal to your students. Use online resources offered by your local libraries to gain access to e-book and audiobook versions. By relying on libraries, you won’t have to worry about purchasing all of the books. Another way to find out about new book titles is by following children’s book publishers, authors and illustrators, and children’s book bloggers on social media. Use the blogs that are on The Horn Book’s website or part of the School Library Journal Blog Network. Perhaps you already use Twitter to share news of your classroom. If you haven’t already, start following children’s book publishers on Twitter and/or Facebook. Look up the latest #NCTEChat to find 2018 book recommendations from your colleagues. Finally, follow along and share posts to the hashtag #NCTEMockHuck to see what others are doing in their classrooms. Depending on the ages of your students and the time that you have available, you will structure your reading differently. Picture books can easily be read aloud to the class. Novels will require more of a time commitment. You might choose to read them aloud over several days, have small groups read them in literature circles, or create a special section in your classroom library that makes them available for independent reading. You’ll want to provide time to discuss each of the titles that are shared in your classroom, carefully considering how the title aligns with the award criteria. If you teach in the primary grades, you will want to be sure that students have an age-appropriate common understanding of the criteria. A “kid-friendly” rubric based on the criteria is included below. Develop a system for keeping notes on your discussions. You might record students’ responses on an anchor chart and post these around the room, or you might rotate responsibility for note taking among the students in your class. Or your students may want to blog about their favorite books on a class blog, documenting their thinking and responding to one another over time. As you read, be sure to share your discoveries and wonderings via the hashtag #NCTEMockHuck. By following that tag, you’ll be able to share the titles that you are reading, find new titles that other classes are reading, and be able to share your students’ responses to books that surface as favorites. Keep the conversation going! At the beginning of November, it will be time to start developing a list of finalists. Ask each student to submit a rank-ordered top-10 list of titles that they feel best meet the award criteria. Have students share their lists in small-group settings, discussing their ranking and how/why they have listed these titles. Meet as a group to compile a class listing, aiming to have 10–20 books to consider. Although it may not be possible for every student in the class to read all the books on the list, provide opportunities for students to read as many titles as possible. By the week of November 12, set a time to hold deliberations and a vote. Invite students to take turns, making a case for their favorite titles. Students should reference the criteria and make it clear why a particular title stands out to them. Hold a series of votes to ultimately identify a winning title and five honor books. 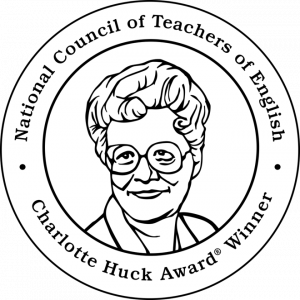 The actual Charlotte Huck Award will be announced on Saturday, November 17, but the committee would love to learn about your selections before then. If you fill out the participation form, we’ll keep you posted as we get closer to the announcement day so you and your class will learn about ways to engage with the big reveal and share your own process! Does the book make you feel what the characters are feeling? Does the book help you imagine new things? Take you to new places? Does the book make you think about your own life in new ways? Does the book help you to see the world in new ways? Does the book help you to think about how we treat others? How we relate to others? Is the book well written? If so, in what ways? How do the illustrations support your reading experiences? In what ways do they stand out? The Orbis Pictus Award for Outstanding Nonfiction was established in 1989 to honor outstanding works of nonfiction written for young people. It is named after Orbis Sensualium Pictus, published in 1658 by John Amos Comenius and considered the first picture book and the first work of nonfiction written specifically for children. Each year a committee of seven educators reviews a wide range of nonfiction published for children grades K–8. The award is bounded by a calendar year. Committee members read continuously, discuss stand-out titles, and as the summer winds down and fall approaches, they narrow their list of favorites, creating a list of finalists that meet the award criteria. In addition, each nomination should be useful in classroom teaching for grades K–8, should encourage thinking and more reading, model exemplary expository writing and research skills, share interesting and timely subject matter, and appeal to a wide range of ages. 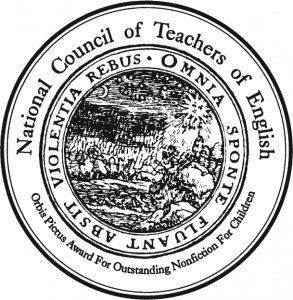 At the NCTE Annual Convention in November, the committee holds a full day of deliberations, carefully considering each of the 30–40 finalist titles they have identified. Discussions are rich and multifaceted as committee members use the criteria to build cases for their favorite books. By the end of the day, the committee members have identified a winning title, five honor books, and eight recommended books. Everyone looks forward to making the big announcement. We invite you and your students to parallel the efforts of these committee members, holding a Mock Orbis Pictus Award competition in your classroom. The beginning of the school year is an ideal time to focus on building a reading community centered upon the act of “finding out” and honoring your students’ interests about the world around them. Explore the Orbis Pictus Award website, reviewing the titles of past award books. Share your intentions to engage in wide reading this fall, conducting a Mock Orbis Pictus Award process. Perhaps you already use Twitter to share news of your classroom. If you haven’t already, start following children’s book publishers on Twitter and/or Facebook. Look up the latest #NCTEChat to find 2018 book recommendations from your colleagues. Follow along and share posts to the hashtag #NCTEMockOrbis to see what others are doing in their classrooms. Chapter Book Nonfiction will require more of a time commitment. You might choose to read them aloud over several days, have small groups read them in literature circles, or create a special section in your classroom library that makes them available for independent reading. If you teach in the primary grades, you will want to be sure that students have an age-appropriate common understanding of the criteria. A “kid-friendly” list of criteria, based on the actual criteria, is included in this guide. As you read, be sure to share your discoveries and wonderings via the hashtag #NCTEMockOrbis. By following that tag, you’ll be able to share the titles that you are reading, find new titles that other classes are reading, and be able to share your students’ responses to books that surface as favorites. Keep the conversation going! The actual Orbis Pictus Award will be announced on Saturday, November 17, but the committee would love to learn about your selections before then. If you fill out the participation form, we’ll keep you posted as we get closer to the announcement day so you and your class will learn about ways to engage with the big reveal and to share your own process! Does the book have a bibliography that shows where the author and illustrator learned the information in the book? Did the author or illustrator ask experts any questions? Is the book clearly organized and easy to follow? Does that organization help you understand the information more easily? How do the illustrations help you to learn more about the topic? How does the whole book—from the cover and end pages to everything in between—help you to better understand the topic? Does the author’s enthusiasm for the topic show through? Does the book ask you questions or make you think? Are unfamiliar words explained to you through the writing? Check out all the books Katie is reading in preparation for her Mock Huck Awards this fall. Stacey Ross and Brennan Cruser offer tips and an inside look into their plans for hosting Mock Huck Awards this fall. Franki Sibberson shares how she’ll use the Mock Orbis Awards to make sure that nonfiction is more valued in her classroom. The following teachers have volunteered to share the titles they find to help you get ready for hosting your own mock awards this Fall. Follow them on twitter and via the #NCTEMockOrbis and #NCTEMockHuck hashtags.